@GJ That was some epic wisdom, and I fully agree with you. On the other side of things, if the CO2 pump turns out to fail you could always repurpose it into an air gun. I don't know if I'd put 150 PSI into a stock reservoir. They aren't exactly the strongest things, I mean some of them will implode a bit from neg pressure if you cut off all the air intake from the cap and then go to pump. I don't even put 150 into Douchenator and that's meant to take high pressure. theoretically, you could make a new tank that you could pressure rate if you mold one. you could make a mold of the origonal tank out of plastic, after you remove the pump and the o-ring; just split the mold down the middle, then think of how thick you want the plastic to be. you could also ,theoreticaly, make a new resivwar that is longer, and curved slightly, for a larger resivwar. Of course, if you have the ability to mold reservoirs, you can generate your own manufactured water gun and this discussion would be moot. -G-JiV- wrote: Hm. This "new" idea is nothing now to me. Sometime ago, I think the last month, I put a check valve into a CPS 2500's reservoir cap and sealed everything. Then I filled the 2500'Äs reservoir with water, screw up the cap and put pressure(air) into the tank. Obviously the chamber refilled automatically. By leaving about 8 bar, which is over 130 PSI I think, I made the PC refill automatically after firing. This way I fired out the whole reservoir volume without any pumping. This is a nice thing, a bit much work since you have to leave the pressure out, refill with water and then put in air-pressure again. But in the end you just get a weaker versions of the "POWER PAK" ... no reservoir but water can be fired till all is out. People are complaining about pressure, so they get a seperate PC. They are complaining about pressure-drop of, so they get CPS. THey are complaining about lack of reservoir volume, so they get CPS 3000/3200. They are complaining about lack of PC volume, so they get Monster XL. They are complaining about so much weight and so much pump to refill, so they get a SC POWER PAK. Then they are complaining about so much time to refill/need of QFD and hose. THey do not like pumping but also not refilling ny QFD. Now we are building pressurized reservoirs, to make the gun refill itself. It is also dangerous to put in pressure into the reservoir, since it is not built to handle pressure! 150 PSI is right enough at a 3/4 with water filled reservoir !! I am using it every now and then but not that often. Good luck and be carefull, HIGH pressure is HIGH DANGEROUS too ! The main limiter here is cost. However, if you do have the money to go for HPA and/or good automatic pumps, then you want to do the job right which means you wouldn't use a stock water gun to do so which is not designed to take high pressure (the reservoirs are so obviously not designed for that) and which aren't designed to operate with anything other than traditional pumping. Whether pumping makes a good part of water warfare or not is completely irrelevant. Manual pumping exists because of practicality and cost issues, and if you want to avoid having to pump, you can build something that avoids it so long as the job is done right; safely and efficiently. Pressurizing a water reservoir (especially one that's not even designed to hold pressure at all) so that it automatically powers up the PC has got to be one of the stupidest water gun ideas I've ever heard of. It completely defeats the purpose of a PC in the first place. In the end, there are many, much better solutions if you really don't like pumping. HPA and auto pumps need to be used appropriately, but you can also use hoses and rely on pre-pressurization. You could have switchable PC's even, each being pre-pressurized, or you can build water guns with very large PC's and no reservoir that run off of hose pressure. In the end, it all comes down to cost. Doesn't sound like a piston to me. You couldn't use one in a stock 2500 reservoir anyway, I mean think about that shape...you'd need to replace the res with something that a piston can seal with. I meant a piston to replace the hand motion of the pumping process. It would be automated instead of having to pump by hand. Guess I was wrong about what he was trying to accomplish though. Yup, me and -G-JiV- basically had the same idea. I am surprised to see that this topic is still front page. C-A_99 made a good point which was 100% correct. Here's what happened in the past 2 months. Anyway, I went to the event where we were going to mess around with it, and we decided to "TURN IT UP TO MAX DUDE, let's see how much damage it can do to that barrel over there!" So I turned up the regulator pressure to max (125psi) and let loose. 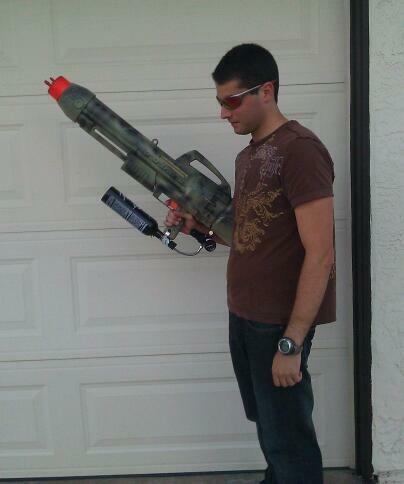 It worked well for the first 10 seconds and then it literally exploded when I released the trigger. Put a nice dent in an empty plastic barrel... but almost every internal component in the gun was ruined. I will post pics of the innards once I finish sorting the mess out. The tank, external checkvalve and nozzle held up though. Moral of the story: CO2 pressurized water gun - not a bad idea. Not great, but if nothing else, makes for a badass looking gun. Over-pressurizing your chamber to show off - retarded and costly mistake. It seems that what you made was actually a kind of CAP modded CPS 2500. Yes the pressurised water still fills the CPS bladder, but when you open the trigger the water will fill the bladder as you empty it with the same pressure the bladder exerts on the water leaving the blaster (if not even more). Therefore, for those ten seconds, the CPS bladder was not providing all of the power, it was partly the water pressurised at 125psi from the reservoir. Therefore it is a PR CAP mod (kinda)! But when the reservoir itself is pressurised, surely there's no need for a separate PC (other than for making a blaster which instills fear into others! )? You would probably have got better results if the regulated CO2 pressurised reservoir was connected directly to the trigger valve, by means of a larger diameter pipe (1/2"-3/4"? ), making a portable CAP modded blaster (because a CAP blaster is essentially a PR blaster which keeps the air pressure constant!). Using a small CO2 canister and regulator for a homemade CAP project may, however, be a good (and smaller / cheaper) alternative to a large backpack CAP design. I may look into this sort of design for future projects. Perhaps calling it the stupidest idea I've ever heard was too mean, but it does defeat the whole purpose of the CPS 2500's design. You're putting something capable of so much more on something capable of so much less really, and maxing out the pressure would have rather predictable results. What a funny thing My idea was tried out ? Did anyone ever test wheather they do have the same internals and they can be interchanged ??? Further, I am looking for a WW PULSE MASTER and/or WW PULSE STRIKE. I am willing to pay much for these guns, so if there is anyone ready to sell, please just contact me!! !